Attending a Youth anti-corruption award ceremony at the Anti-Corruption and Civil Rights Commission in Korea turned out to be a sweaty event. Normally, travelling in Asia as soon as you enter a public building temperatures drop to below 20 degrees and one worries about catching a cold. Not this time. Last week, South Korea ordered sweltering government offices to turn off their air conditioning as two power plants stopped operations amid a corruption scandal. The timing could hardly be worse with South Korea in the grip of an extended heatwave and temperatures at 34 degrees. Working with youth as the next generation in power in Korea is critical in shaping a society where values of integrity are held high. Despite the heat and the stifling air, the young corruption fighters kept the energy levels high. 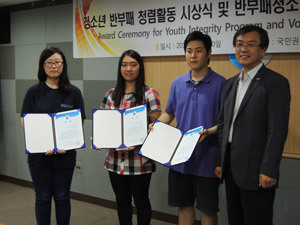 Five teams from high school and university had been given small grants by Transparency International Korea to run their own anti-corruption projects. Teams developed different approaches to spreading anti-corruption messages in schools, homes and public places. For example, one team ran an anti-corruption awareness campaigns in school about the problem of students paying bribes to see tests before taking them. The teams developed different approaches to spreading anti-corruption and integrity messages in their schools, home districts, subways, and public places through dance performances, short plays and information boards about corruption displayed across the country. One team has posted a Gangnam style video. After the award ceremony, each team nominated one person to sit on the steering committee of the newly formed Korean Youth Against Corruption group. The group will define their own activity plan on how they can become active against corruption. They will also mentor the next round of small grant recipients. Each team nominated one person to sit on the steering committee of the Korean Youth Against Corruption group. The results of the Youth Integrity Survey carried out in Korea show that young people are more likely to forgo values of integrity in the pursuit of wealth than adults. Of the 1,000 young people surveyed, 40 per cent thought being rich is more important than being honest, versus 31 per cent of the 1,000 adults. Therefore working with young people as the next generation in power is critical in shaping a society where values of integrity are held high. Hopefully these young people will inspire many more young people in Korea to take action against corruption so that in the future the air conditioning can be turned on again. After all, small steps taken by young people setting small examples against corruption can have a big impact in the long run.